You can follow the programme’s progress here. Following Himalayan traditions, which firmly believe in respecting natural beauty, local biodiversity, and resources, EVA is committed to using sustainable construction methods and technologies to build this school. The IHS takes advantage of new sustainable and innovative practices, such as using gabion to fortify the foundations of the buildings and designing the building rooftops to capture rainwater. Gabion is a very adaptable technology that we are using to construct the outer wall of the school as well as for its structural foundations. Gabion blocks can last as long as 50 years, be repaired easily, and they are resistant to structural failure during earthquakes. Since our mission is to empower marginalised groups and preserve Himalayan traditions, EVA and its partners are committed to educating girls and incorporating cultural education at this school. The girls will be taught the same lessons as the boys. Moreover, we will develop a curriculum that is dedicated to teaching the students about their own cultural traditions as well as those from across the Himalayas. We believe that because of this programme, each student will have a better understanding of their unique heritage and a chance to pursue higher-level education, specialized vocational training, or entry-level employment when they leave the school. With your help, you can make a large impact in the lives of others. Please make a donation. In this part of the world, many communities lack adequate healthcare facilities and qualified healthcare providers. Most villagers have to walk to the nearest simple clinic or hospital, which can be 4 or 5 days away. Unfortunately, many die on the way. The Himalayan Medicine School Programme, in cooperation with the Four Medical Sciences of the Early Tradition School in Kathmandu, Nepal will improve the access of health care for those living in the remote mountainous regions of this country by training local members of the Himalayan community the skills used in traditional Tibetan and Himalayan medicine. These techniques use a comprehensive, holistic approach to healing. Many of these practices are now gaining worldwide interest as relevant and effective treatments. Under the guidance of experienced doctors from this rich medical tradition, the students will first learn how to: 1) develop high-quality herbal remedies and; 2) maintain the tradition’s rigorous purity requirements. Over time, they will also learn how to diagnose and treat patients at the school’s charity clinic. At present, this school has two degree-bearing programs: a doctor’s degree in traditional Himalayan medicine (9 years) and a traditional Himalayan nursing degree (5 years). There are 13 students at this school currently studying in very austere conditions. These students work with antiqued measuring equipment and learn in cramped quarters. After classes, students study on their beds because they lack a study area. With your support, our programme will improve these conditions by providing the school with newer measuring equipment and a larger study area. Eventually, the Four Medical Sciences of the Early Tradition School will train and house up to 15-20 students a year. After completing their degrees, the students –most who come from the remote mountainous regions of Dhorpatan, Dolpo and Mustang, Nepal– will not only have the means to support their families, but also the valuable knowledge to provide healthcare in their isolated communities. At the Enlightened Vision Association (EVA), we believe the best way to assist these individuals is to have an encompassing, holistic relationship with their community by collectively sponsoring them. Programs that focus solely on assisting individuals can undermine delicate social relationships as well as create unrealistic expectations of progress. Our approach, however, will take steps to build sustainable relationships with community leaders and families in order to minimize any social harm. In our Himalayan Medicine School Programme, we will provide material support to a traditional Tibetan and Himalayan medicine school in Katmandu in order for it to hire and maintain its qualified staff. We will also support the school’s students as they pursue their degrees in traditional Himalayan medicine, since they would be unable to finish their studies without further support. By using collective sponsoring, EVA will provide information to sponsors twice a year that describes the children’s curricula, testimonies and photos, along with a detailed description on the project’s evolution. Regular sponsoring fees and donations allow us to finance these programmes so that we can, together, help preserve the cultural heritage for those living throughout the Himalayan region while expanding their horizons. A Mandala is an ancient and potent symbol found in several Asian religions, including Hinduism, Buddhism, and Bon.The Tibetan word for mandala, kyingkor, means ‘centre [and] circle.’ This term implies an intimate relationship between the core and the periphery, as noted by Professor Charles Ramble, in the introduction of the exhibition catalogue. The sixteen unique mandalas of this exhibition were specifically commissioned for the Mandalas: Mirrors of the Cosmos art exhibition that will open on October 17, 2013 at Bel Air Fine Art Gallery in Geneva, Switzerland. Every mandala was drawn and painted according to the precise iconometric prescriptions set out in the ancient texts of the Bon religion. If you want to own any of these mandala paintings, please contact us at info@evaassociation.org for more details. 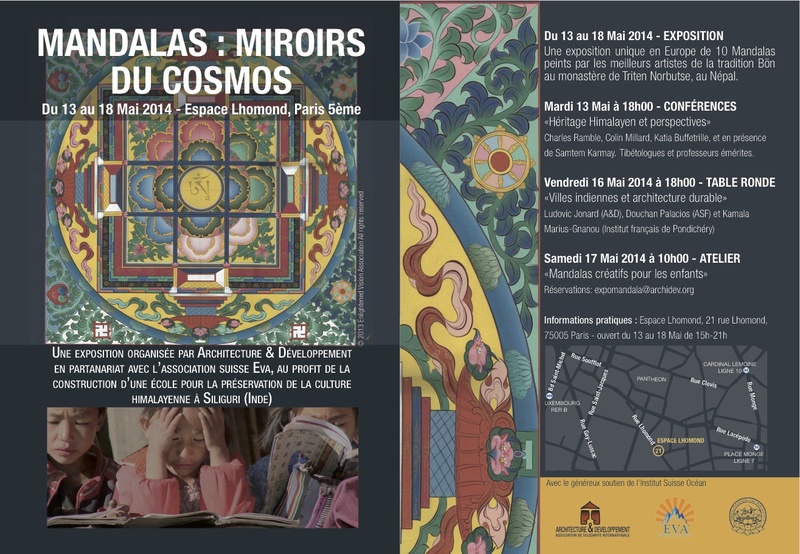 For those interested in obtaining the official Mandalas: Mirrors of the Cosmos Art Exhibition Catalog, please click here. All proceeds will directly fund the International Himalayan School Programme in Siliguri, India. When you contribute to this programme, you will play a critical role in preserving this unique Himalayan tradition for future generations. The blog Siliguri Adventures follows the development and the implementation of the International Himalayan School in Siliguri, India. Keep updated! EVA has been granted tax exemption status from both federal and cantonal/municipal taxes. One of the main advantages of the tax exemption is that physical and moral persons who make a donation to a tax-exempt NGO headquarted in Switzerland, may deduct the amount of the donation from their own tax declaration. EVA currently functions on a volunteer basis to create more vibrant, healthy and sustainable communities for Himalayan populations. For this, we also need your generous support!